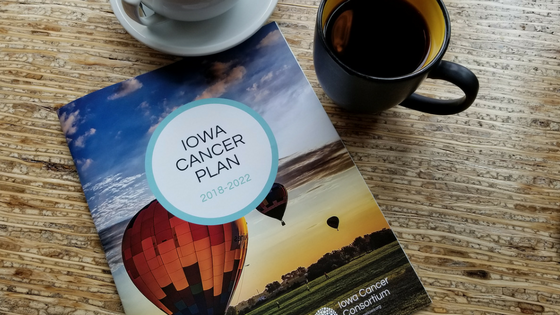 I recently spent two days at the Iowa Cancer Summit, which included the release of the updated Iowa Cancer Plan. The Cancer Plan’s goal is to reduce the burden of cancer in Iowa. It was a full two days of talking about cancer – new treatments, prevention, causes, access to care and other necessary resources, health equity, and sharing stories. I had the privilege of participating on a panel with four remarkable people who had first-hand experience with cancer. I provided the perspective of a caregiver. (My Experiencing Cancer posts share more of my caregiving and healthcare experience with my mother’s diagnosis and journey.) You can watch the panel via Facebook video on the Iowa Cancer Consortium’s Facebook page. 1. Listen to what your body and mind is telling you. One of the women on the panel was an ovarian cancer survivor, diagnosed at age 26 (which is significantly younger than the average age of diagnosis). She lived with symptoms for over a year before her diagnosis – symptoms which included: abdominal bloating, pressure, and pain; abnormal fullness after eating; difficulty eating; an increase in urination; and increased urge to urinate. Ovarian cancer is not found on a Pap test, so it is difficult to diagnose. Pay attention to your body and talk to your provider if you feel something is not right – even when initial tests say otherwise. During her treatment, she sought out more support – specifically looking for others her age with a similar diagnosis. This type of group did not exist, so she created one. This group continues to grow and support women with newly diagnosed cancer. 2. Survivorship programs are becoming increasingly necessary. As children diagnosed with cancer are experiencing more and more successful outcomes, the need to monitor these patients into adulthood has increased. The psychosocial and future medical needs are complex, requiring special attention and collaboration from many specialties. Not only is the risk of a cancer recurrence possible, the long-term effects of treat impact many other organs, fertility, chronic conditions, psychological and health habits. This field of care is still emerging and learning as these children grow. Transitioning the care of a pediatric cancer patient to adult specialists can cause stress and anxiety so having a program in place to smooth this transition is valuable. Adolescent and Young Adults (AYA) Survivorship programs have been developed at both UI Stead Family Children’s Hospital and Blank Children’s Hospital. This topic was particularly interesting to me after having spent a majority of my healthcare marketing career working with children’s health. Pediatric cardiology patients faced similar challenges as the treatment options continued to improve, resulting in more positive health outcomes. 3. Health equity is a barrier to care. Yes, insurance and ability to pay for out-of-pocket expenses play a role in a person’s treatment plan (or lack of treatment). However transportation, geographic location, gender identity and sexual orientation, health literacy, and much more factor into health equity. Seeing these considerations framed under the umbrella of “health equity” was a new concept for me. I recognized these as barriers to accessing care but had never tried to label it or draw the connections presented by the keynote speaker – Adewale Troutman, MD – or as outlined as a goal of the Cancer Plan. During the afternoon session, I moderated a conversation related to the role financial resources play in cancer care and the impact those resources would play on patients, caregivers, and the healthcare community. Many great ideas were developed. Ultimately having better communication channels regarding the services/resources currently available could make an immediate impact. Another suggestion was having both insurance and care navigation offered to newly diagnosed patients and families. An insurance navigator would help articulate what insurance will cover and how much, as well as help anticipate potential out-of-pocket expenses. The care navigator would outline the potential treatment plans for the patient so they can anticipate timeframes, initial schedules, and assistance they may need to receive the care. 4. Access to clinical trials is complex to both the healthcare provider and the patient. While the benefits of clinical trials can be tremendous, matching patients to trials can result in significant effort. It is often left up to the patients and their families to keep an eye on the trials they could benefit from that are taking place at different cancer centers in the state, region or country. While individual cancer centers keep a list of their own active trials, there are so many being offered by other centers it is nearly impossible for the providers to know if there are other trials to benefit their patients. I admit I was surprised to hear there isn’t a better central tracking system for all trials, regardless of where the trial is offered, to make it easier to enroll participants. A trial can only be validated with participants, and participants will only benefit if they know about the trial. This seems like an opportunity for an entrepreneurial software developer… any takers? 5. It takes a village. Just as in raising children, cancer needs a village. The diversity of people who attended the Iowa Cancer Summit – doctors, nurses, public health professionals, healthcare administrators, individuals with cancer, caregivers, religious leaders, legislators, individuals representing cancer-focused non-profits, support groups, marketing/communications professionals – all have a role to play. It takes all of us understanding our role in the future of cancer prevention, treatment, and CARE. We are all stronger together but each of us individually has the power to make an impact.